The 05060265001 Wera 869/4 M Magnetic Metric Nutsetter is one of thousands of quality tooling products available from MRO Tools. Please browse Wera Magnetic Nutsetters, Imperial for tools similar to the 05060265001 Wera 869/4 M Magnetic Metric Nutsetter. 05060265001 Wera 869/4 M Magnetic Metric Nutsetter description summary: Wera 869/4 M Magnetic Metric Nutsetter. 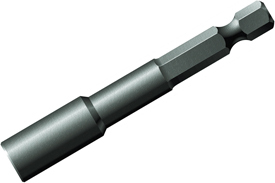 Point Size: 3/8'' Shank Diameter: 14.0mm Shank Overall Length: 65.0mm Quantity discounts may be available for the 05060265001 Wera 869/4 M Magnetic Metric Nutsetter. Please contact MRO Tools for details.